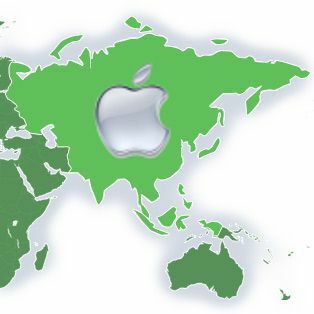 Apple will gain access to two of its biggest markets if reports it's set to sign deals to sell the iPhone in China and Russia are to be believed. The AFP is reporting China Mobile and Apple are in final talks to supply the iPhone 3G to the masses, with a deal set to be concluded soon. The obstacle to supplying the device in this country was the necessity of revenue-sharing, but give Jobs' desire to get the iPhone out there seems to brokered some kind of deal. Russia, one of the largest potential markets outside the US for the iPhone looks almost certain to get the device after rumours of the top three carriers brokering a deal emerged. Number two supplier Vimpelcom has come out and confirmed it will be bringing the iPhone to the country in the coming months, and the third biggest carrier Megafon has also verified claims it will supply the handset. The biggest of the three, MTS, has declined to comment on rumours it has also been in contact with Apple over a possible deal, but Russians seem certain to be able to get their hands on the handset soon. This news will be greatly received by international justice organisations, as the iPhone has been very popular on the grey markets in these countries, commanding prices over three times those in the US. Apple's target of 10 million iPhones sold by the end of the year will be greatly boosted by deals in these territories, so expect deals sooner rather than later.